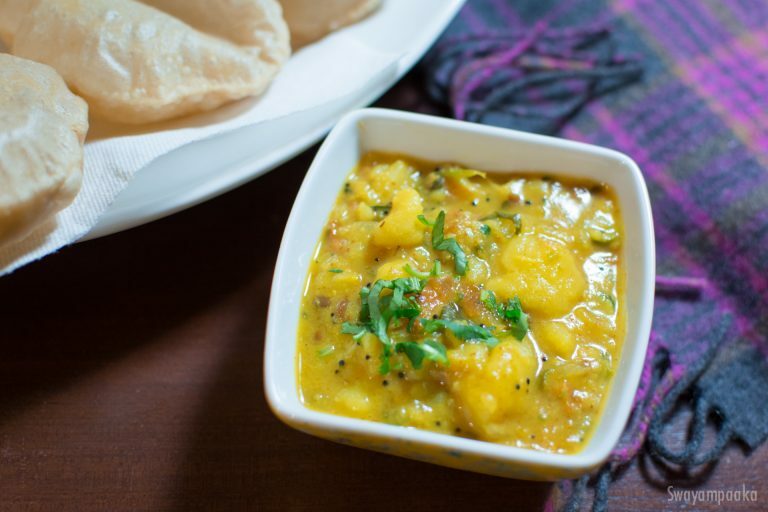 Bombay saagu or Potato sagu and Poori is the very popular combination you see in every restaurant menu. Simple ingredients, very easy recipe is this potato sagu. No grinding required. Saagu can be prepared using mixed vegetables as well. Bombay Sagu goes well with chapati, rava idli, and set dosa. Once the oil is hot enough add hing, mustard seeds. Once the mustard seeds pops add urad dal and chandal mix. Fry it until the dal turns golden brown. Now add chopped green chillies, stir it once or twice, then add the chopped onion , turmeric powder, ginger and curry leaves.. Sprinkle some salt, stir it. When the onions are little cooked add chopped tomatoes, stir it few times. Add water to the besan flour, mix it and add dania powder, chilli powder. Add potatoes, Add water(I used around 1.5 cups) mix it well. Let it boil on medium heat for 5 to 6 minutes. Serve hot with poori, chapati, rave idli , set dosa….. I am very impressed with the wonderful list of exotic originals. Pl do contact me on 9513069937 or [email protected]. I am a start up company owner and wish you could represent us for a great working experience for both of us.